In Basic Training not long after DDT was banned, we were all handed containers of DDT to sprinkle on our mattresses for bed bugs (Ft. McClellan, Alabama). @CJ That was 1947, so it's $91 - $137 in inflation-adjusted dollars. And you thought the Shell No-Pest Strip was bad! But with this, your child gets to enjoy Pluto and Donald Duck as they're being slowly poisoned. 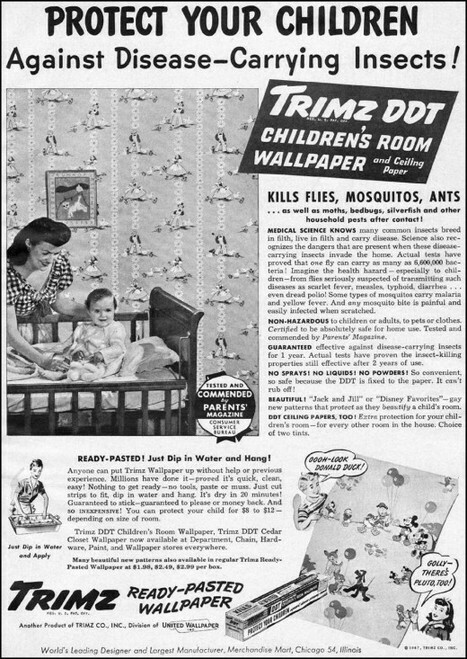 kluv42 - What with asbestos, lead paint and toys, and playing with mercury - what harm can a little DDT do?